Printed in the 1800's, original engraving (10" x 8") by H. Wright Smith. This came from the Herzog and Co. / R.M. Smythe archives when they were relocating their offices in Manhattan. This engraving would look terrific framed. Irvin McDowell (October 15, 1818 � May 4, 1885) was a career American army officer. He is best known for his defeat in the First Battle of Bull Run, the first large-scale battle of the American Civil War. Eventually, the three independent commands of Generals McDowell, John C. Fr�mont, and Nathaniel P. Banks were combined into Maj. Gen. John Pope's Army of Virginia and McDowell led the III Corps of that army. 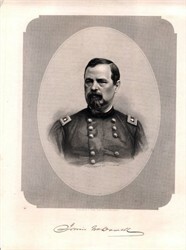 Because of his actions at Cedar Mountain, McDowell was eventually brevetted major general in the regular army; however, he was blamed for the subsequent disaster at Second Bull Run. He escaped culpability by testifying against Maj. Gen. Fitz John Porter, whom Pope court-martialed for alleged insubordination in that battle. Despite his formal escape, McDowell spent the following two years in effective exile from the leadership of the Army.